This time of year is very exciting for our Fireflies; the Dashain festival is upon us. Dashain is the largest and most notable festival on the Nepalese calender. Many of the Nepalese expatriates I knew here in NZ have returned to Nepal specifically to observe the Festival which lasts for 15 days. During this time, schools and many businesses close. Like all Nepalese, our Fireflies celebrate Dashain with traditional festivities; we clean our home and decorate it, every child gets a new outfit to wear, they have a tika ceremony and eat a special meal that my include something they don’t normally eat eg: meat. 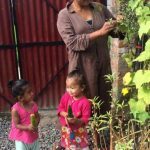 Our gardens at both homes are growing well with the children taking a strong interest in cultivating crops. 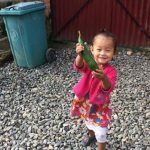 In keeping with our beliefs, we invest time in equipping the children with life skills that will carry them smoothly into Nepalese village life including farming, cooking and crafts. I am so humbled by the tireless effort our staff and school teachers continue to make in nurturing our Fireflies the Nepalese way. 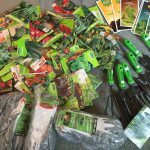 Speaking of effort and commitment, during Dashain six women from NZ are heading to our home with a suitcase full of gardening tools, gloves and seeds. Whilst it is not difficult to work out what to take (as we always require clothing, books and stationary) this gardening initiative is a unique and brilliant idea! Thank you to Miriam Godfrey and friends. In the past we have had people organize fun runs, bake sales, auction evenings and lunch fundraisers. Children have also donated their school mufti-day funds. With this kind of giving, many childrens’ lives benefit and the happiness and fulfillment you get is an added bonus! If you are ever interested in giving financially to our home, contact me with your fundraising initiatives and I’ll do what I can to support you. Currently, we require two new ablution blocks (toilets and showers) for the boys building.